CARFAX One-Owner. Clean CARFAX. Certified. 2017 Nissan Pathfinder SL CVT with Xtronic V6 Compass (Mirror-Navi), NissanConnect Services Powered By SiriusXM, NissanConnect w/Navigation & Services, Power Panorama Moonroof, Radio: Bose Audio w/AM/FM/RDS/MP3/CD & 13 Speakers, SL Premium Package, Trailer Hitch Receiver w/Integrated Finisher, Trailer Towing Harness. 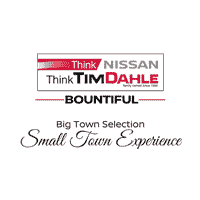 When you think used cars THINK TIM DAHLE NISSAN BOUNTIFUL. We have over 500 years experience in the service department that want to serve you. We do a rigorious inspection to make sure the car is great for you and we have the cleanest interiors and best mechanically sound vehicles in the valley. Odometer is 23534 miles below market average! CARFAX One-Owner. Certified. 2017 Nissan NV Passenger SL RWD 7-Speed Automatic V8 Navigation System. When you think used cars THINK TIM DAHLE NISSAN BOUNTIFUL. We have over 500 years experience in the service department that want to serve you. We do a rigorious inspection to make sure the car is great for you and we have the cleanest interiors and best mechanically sound vehicles in the valley. Clean CARFAX. Certified. 2019 Nissan Armada Platinum AWD 7-Speed Automatic 5.6L V8 DOHC 32V Endurance AWD, Cargo Package, Navigation System. When you think used cars THINK TIM DAHLE NISSAN BOUNTIFUL. We have over 500 years experience in the service department that want to serve you. We do a rigorious inspection to make sure the car is great for you and we have the cleanest interiors and best mechanically sound vehicles in the valley.